Hooray For The Humble Hock! Except for an eight month stint in England when I was 12, I spent the first 26 years of my life living in Northern California. And during all that time, I cannot remember ever buying pork. Oh, I ate it alright. Growing up, my mother often made us scrambled eggs with chopped bacon, and we had the occasional dinner of pork chops or pork roast. And of course every time I ever ordered pizza it was sausage, black olives, and mushrooms all the way. But going to the store and actually purchasing an uncooked pork product? Never happened. A lot has changed since I left California and moved to the Midwest. Granted, I still haven't walked into a supermarket and emerged clutching a package of bacon. But I have certainly paid for my fair share (at least) of pork. Yes, I went from no pig to whole hog. I had absolutely no idea what I had been missing all those years. I am now quite adept at getting exactly what I want out of my locally raised, 240+ pound hog when it heads to the Mennonite butcher. Pork chops one inch thick, four to a package. Pork roasts about 2 pounds each. All the 'stew meat' they can find (which we either grill as kabobs or grind into fresh pork burger). Ground pork in one pound packages. The lard in manageable two pound packages (yes, I render down my own, but that's a whole other story). Yes, of course we want the ribs. And the ham steaks, bacon, jowl meat, ham roasts, hock roasts, and hocks all naturally smoked without nitrates. (Apparently I was the first person to ever request this, and when I picked up my order, I all but had to sign a waiver that I wouldn't sue the processor for getting sick from eating bacon without the "cure." He was clearly in a state about this, though I was not. And several hogs and many years later, I'm still here.) All of this for less than $1.50 a pound. When it comes to pork around here, we are very spoiled. When Kate Hill and Judy Witts invited me to join their Some Pig Blogging Weekend, a food blogging event in honor of San Antonio Abate, the Patron Saint of farmyard animals, whose feast day is January 17th, deciding what to write about was easy. I figured I would simply share my delicious recipe for homemade Italian sausage. Unfortunately we appear to be down to the piggy dregs, because after diving into every single deep freezer yesterday, I could not find a single package of ground pork lurking anywhere. What I did find were two hidden pork roasts and a lot of smoked hocks. Yep, we are obviously nibbling on the end of the hog. Not a problem, I realized. Homemade Italian sausage is divine, but the poor hock is sadly underrated and could obviously use my help. 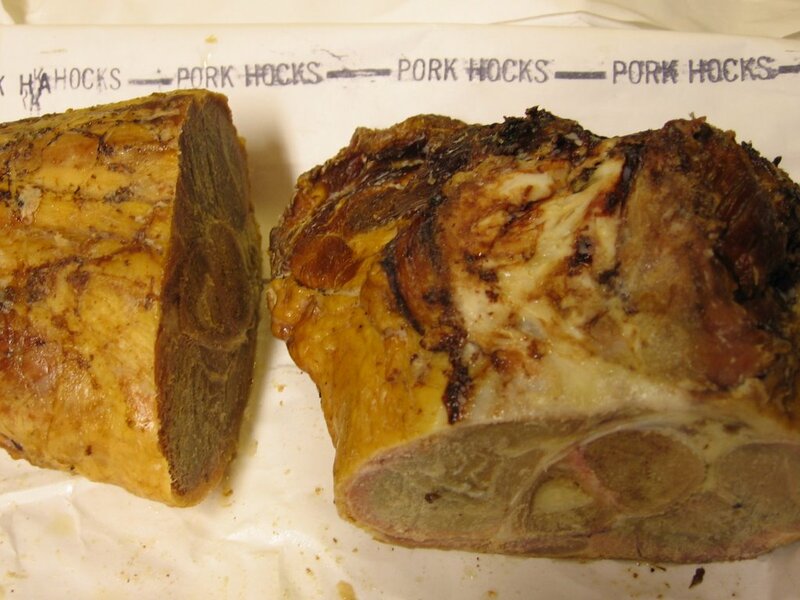 For one thing, supermarket hocks just do not compare to the real thing. You need to seek out and choose your "lesser" pig parts with as much care as you do your chops and roasts. And once you find a reliable source for meaty smoked hocks, you will be in, well, hog heaven. Simply drop one or two into any soup you are simmering on the stove, pick up a good book, and wait for the magic to happen. Lentil soup, split pea soup, white bean soup--you will never want to eat the vegetarian versions of these again. Cook them long and slow, until the meat is falling off the bone, teasing you with its heavenly aroma and dark pink color as its divine smoky flavor seeps into every molecule in the pot. If you do not have the makings for soup because, for instance, you had been planning on making Italian sausage, there is an even better way to celebrate the humble hock, and that is by smothering it in gravy. This is comfort food at its very best. Hot, salty, cozy, and not anywhere near the healthy border. Comfort me with gravy, is what I always say. And that is what I did last night. You can tuck into this homey concoction any time of day. At breakfast, do not bother cooking up some eggs to go with it, as no one will have any room for them. And if you absolutely insist upon serving it with a vegetable at lunch or dinner, please realize this is not the time for a light salad. I suggest creamed spinach. And bear in mind that this is the kind of dish that induces lethargy and long naps. The recipe is so simple that I don't even have a proper name for it. 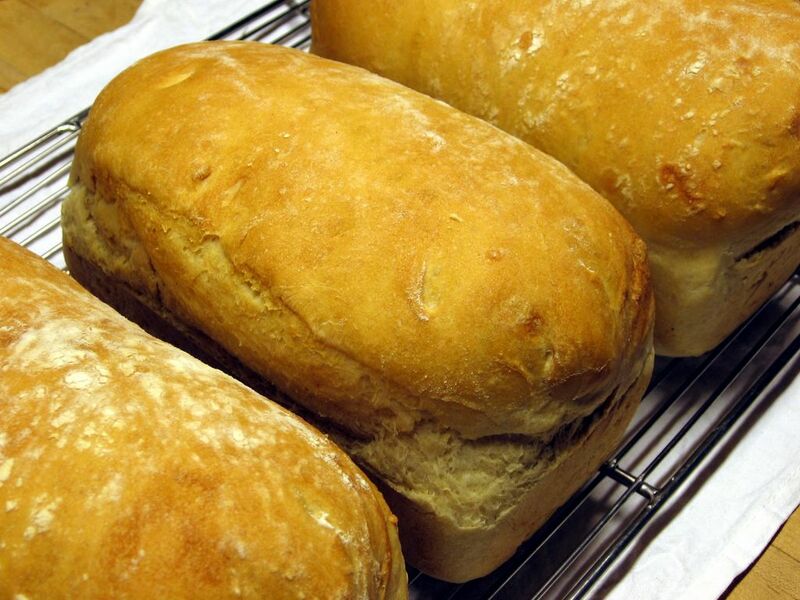 But before you prepare this comforting stuff, you must first bake some nice white sandwich bread. What you want is the kind of bread that has a pleasant crunch to the crust when it is warm, is nicely chewy when it cools, and has a dense but soft interior. If you time things right, you can slice off the warm heel, slather it in butter, and eat it with the bits of hock meat you have just burned your fingers on because you absolutely could not wait to try them. (Yes, if you are anything like me, this is one of those meals you will most likely sit down to already full, but sometimes that simply cannot be helped.) Acceptable substitutes would be homemade biscuits or cornbread or even some toasted slices of whole wheat beer bread. You need something substantial that will not turn to mush under the weight of all that meat and gravy. It is also very nice with rice. While your bread is rising and baking, place the hocks in a heavy saucepan and cover them with water. Bring to a boil and simmer gently until the meat is falling off the bones and the water has become infused with the smoky essence of pork--an hour at the very least. Remove the hocks from the water (do not toss it out!) and place them on a plate to cool. Pull off as much meat as you can so that it will cool faster, and try not to devour it all in the process. (Filling up on warm bread at this point can sometimes help.) Then set the plate where the cats cannot reach it (don't ask). Once the meat has cooled, shred it into bite size pieces, and then melt a few tablespoons of butter in another heavy saucepan over medium low heat. Using a whisk, stir in an equal number of tablespoons of flour to make a roux. Let this cook for a minute or two, and then slowly begin adding some of the pork stock (is there such a term? ), whisking constantly, to make a gravy. Use part milk for a thicker, creamier gravy. If I had been thinking ahead, I would have first browned the uncooked hocks in a little oil or lard in the gravy pan so that there would be nice caramelized bits mixed into the gravy. But when there are three loaves of bread that need baking and hocks that need photographing, not to mention sheep and llamas and a donkey that need feeding, well, sometimes those yummy extra steps slip one's mind. No matter. The end result will still be delicious, and there is always next time. When the gravy is done to your liking, stir in the shredded meat and heat for another minute or two. Then turn off the burner, cover the pot, and slice and toast your bread. Place the toast on large plates and smother them with the meaty gravy. Add salt and pepper to taste, and dig in with a knife and fork while it is hot--all the while giving thanks for the humble smoked hock. Holy hamhock! Can you believe I simply buy really good smoked hamhocks at Safeway? Thanks for drawing attention to a really valuable part of the pig. 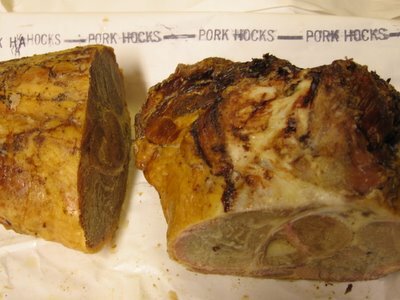 I don't know that I have ever eaten the hock, but it looks like a lot of the comfort food I grew up on. I'm always up for more pig, so I will be pursuing our local butcher in the near future! Zuni Cafe Cookbook has a recipe for pork stock that uses the whole head of the pig. Yours sounds much more appetizing! Now all it needs is a few good dashes of hot sauce. :G: What can I say? Living in California, the Southwest and the edge of the South, I'm addicted to the stuff. Have you ever thought about making scrapple with some of them tender cooked ham hocks and their broth? Sounds yum. And it's sooo good with hot sauce! Do, you detect a them? Why, yes you do. And I may just switch and do that instead of adobo. Frankly, I think most any food that I do not have to cook or clean up after is pretty to me. Comfort food isn't always known for how pretty is looks but what warm and loving memories it evokes. That's pretty to me. It is pouring with rain here I haven't had breakfast and that pic is KILLING ME Oh MY! Yum yum! I enjoyed hearing about what you get from your pig. Do you follow a Nourishing Traditions type of diet? How many times did I hear you kids mimic the Brady Bunch's "Poooork choops and appllesaauce"? Can hardly wait for this on my next visit! The gravy - outstanding! Great blog! Just wonderful. I wanted to participate in this but I just couldn't fit it in. But I am having fun reading what other people came up with! Naturally smoked bacon..."uncured"? Hardly! If anything, it's cured twice. Bravo for saying no to the nitrates! Go away. Just go away and quit posting and take your ham hocks and gravy and bread with you. It's just not fair to post stuff like this. i just can't get my head around white gravy. but if you call it sauce, then I am love with the look of this dish. WHo says it's not pretty, huh? "Sure, Lisa, there's some magical that gives us tasty pork chops, bacon, ham steaks, and sausage in one go. Pish. Yeah right!" I LOVE COOKING PORK HOCKS!!! divine if you know how to cook them well..
oh. my. god. i'm drooling. We raised our own pigs for the first time this year. I've been wondering what to do with the hocks other than soup. I'm headed to the freezer to find them now. Thanks! 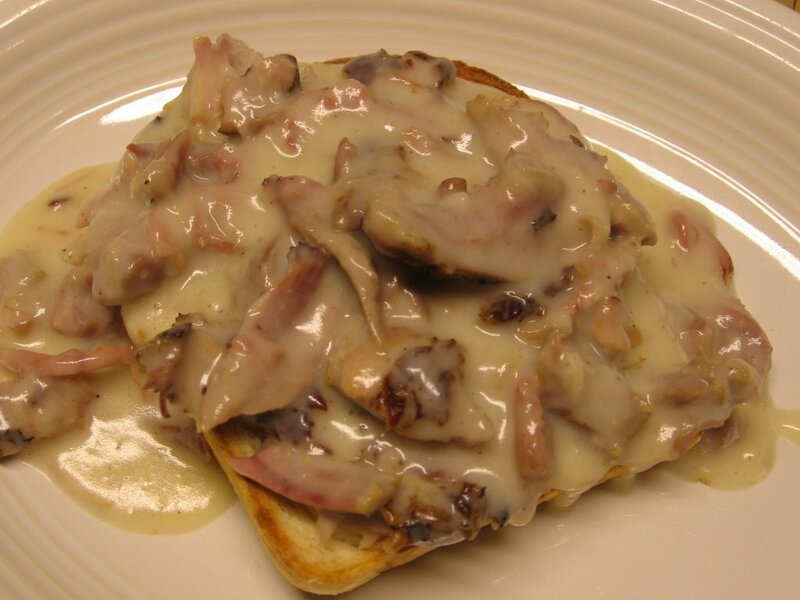 My Memere' use to make ham hocks with gravy. She passed away 17 years ago and no one in the family knew how she did it. We're expecting a snow storm tonight and this morning I was day dreaming about that comfort food, so I went out and bought some hocks. When I came home I googled the recipe and there you were. The recipe and picture look perfect. Thanks for helping me re-create that beautiful memory. Naturally, I spent hours searching Ham Hocks before I discovered these pages. Then spent more and more hours reading your stuff, can only say ty for fun, insight and inspiration.